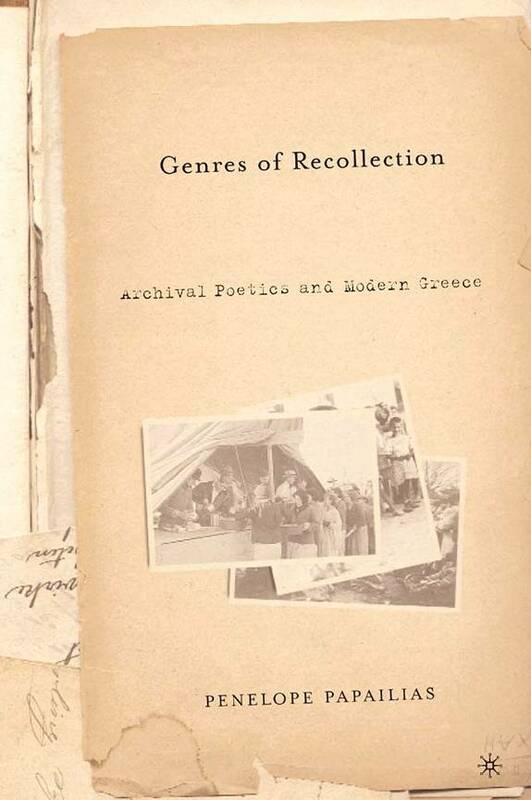 Penelope Papailias, "Genres of Recollection: Archival Poetics and Modern Greece"
This innovative ethnography of history-in-the-making explores some of the most traumatic and wrenching experiences of twentieth-century modern Greece refugee crisis, transatlantic migration, civil war, urbanization, and industrialization. Hardly a survey, Genres of Recollection asks how the very categories of historical practice and knowledge–the witness, the archive, the event, and, of course, the historian and historiography themselves–have been defined, contested, and reimagined in the ongoing process of documenting and narrating the past. In a series of intricately-crafted case studies, Papailias peruses the personal archives and independent publications of a diverse cast of amateur historical producers-from a housewife and a farmer to an award-winning novelist and a cosmopolitan aristocrat. Despite not being historians (as they unabashedly acknowledged), these scribes, archivists, and authors, nonetheless, had been compelled to re-collect personal and community histories they believed were being forgotten or actively repressed in national or global narratives. By drawing attention to the disciplinary and geohistorical margins of History, this study challenges assumptions about where it would be most important and interesting to study the politics of historical production and, in the process, demonstrates the destabilizing potential inherent in anthropologys engagement with history.